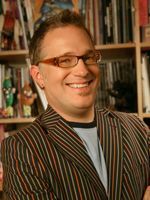 Tony DiTerlizzi is the co-creator and illustrator of the #1 New York Times best-selling Spiderwick Chronicles, which was adapted into a blockbuster movie in 2008. The Spiderwick Chronicles have been translated into over 30 languages and have sold millions of copies. Tony won the Caldecott Honor Medal for his adaptation of The Spider and the Fly and the Zena Sutherland Award for his illustrated children's book, Ted. In the gaming industry, he’s best known for his work in the collectible card game Magic: The Gathering and on the Planescape product line for the Dungeons & Dragons role-playing game. This interview is with Tony DiTerlizzi and Holly Black.